Home About Recipes Mini Mitts How To Use Media Contact Buy Now! The Lids fit on top of most glass and porcelain bowls, mugs, pots, and cookware. Microwave, refrigerator, dishwasher and oven safe (up to 450’). Made of strong, Borosilicate glass. Two products in one… a vented plate cover that flips over to become a 2 quart baking/serving dish, use to reheat leftovers and steam food. Heirloom quality Borosilicate glass. Watch as Susan demonstrates how to use her all glass patented Cuchina Safe ventd lids and the Cover ‘n Cook plate cover, live on HSN. Susan shares some cooking tips and some fun recipe ideas too! Cooking vegtables, eggs and cauliflower pizza! Now available on Amazon! The non-slip Neoprene Grip mini mitt. Made for small grip items, especially for microwave and slow-cooker use. Perfect for finger/palm coverage, making handling HOT cookware easy. Vented Glass Lids safely cook, steam and reheat food in the microwave and oven! Now featured on HSN and QVC! 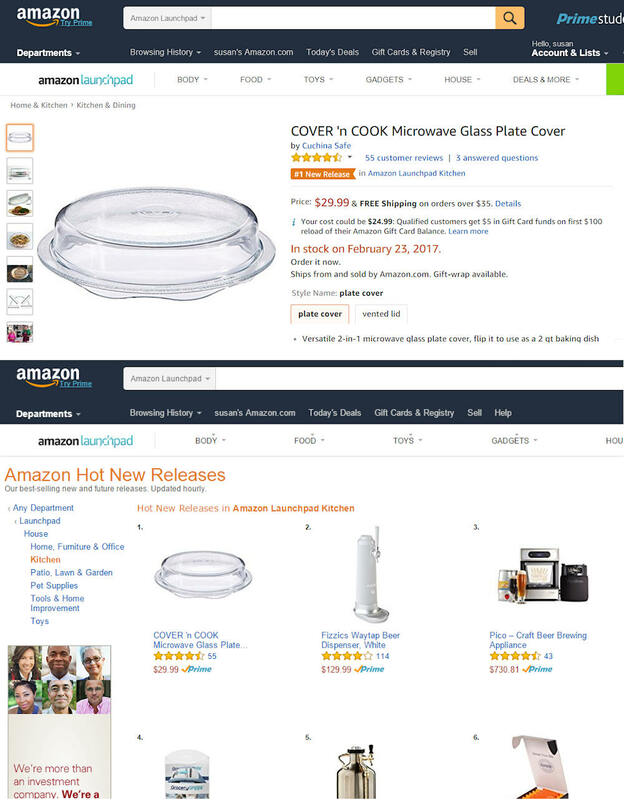 Cover ‘n Cook named #1 “New Release” in AMAZON Launchpad Kitchen!